The camino had changed. First of all, we had entered a new region, Galicia, which has its own language more closely related to Portuguese than Spanish. Secondly, the terrain was most definitely mountainous. O Cebreiro is located at the top of a mountain and Nathan and I were certainly glad to see it after our long up hill hike. We celebrated with a bottle of sidra (cider) which came with a surprise. It seems to be a tradition to pour sidra by holding the glass low and the bottle high. With no skilled sidra pourers that night, the bartender instead handed us a mechanical contraption to help us out. We christened him Pedro and he indeed poured a mean glass of sidra. 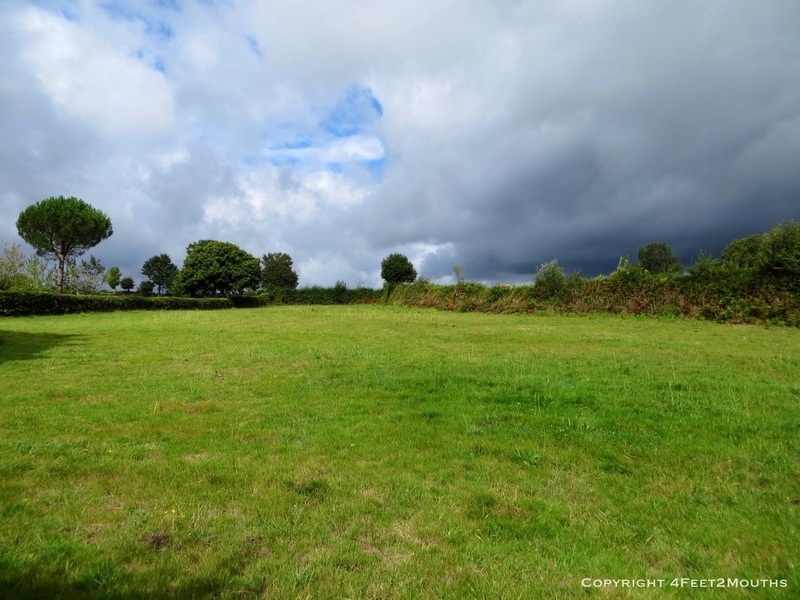 Other than language and terrain, Galicia has another distinguishing factor: weather. Up to this point, we had experienced the hot, dry and sunny Spain one expects. 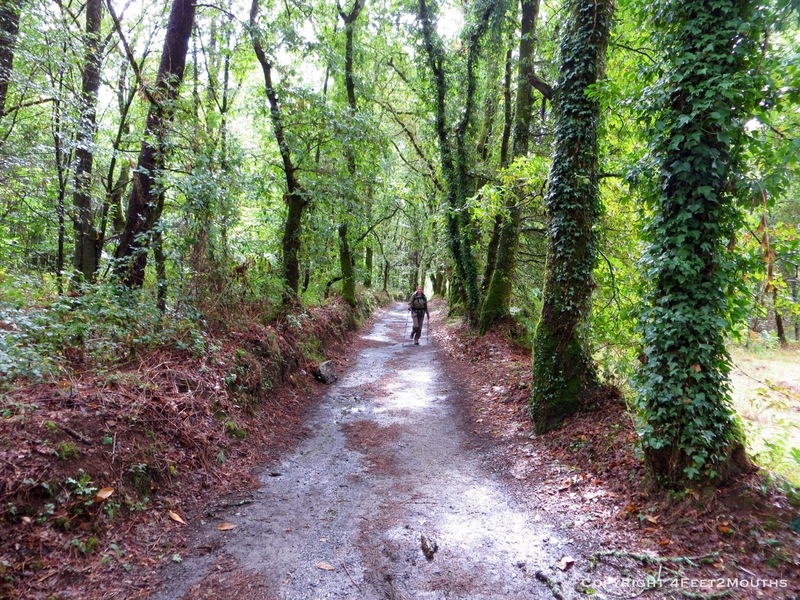 On our descent from O Cebreiro we got out first taste of the rain Galicia is known for. After digging out our ponchos from the bottom our packs we trudged on through thick droplets and wind that at times sounded like a train coming at us. With all the rain, stone buildings and slate roofs, I felt like I had found a secret portal to Ireland right at the edge of Spain. By the time we reached Triacastela we were soaked and ready to dry off. We holed up in a cozy albergue and didn’t leave until dinner time. 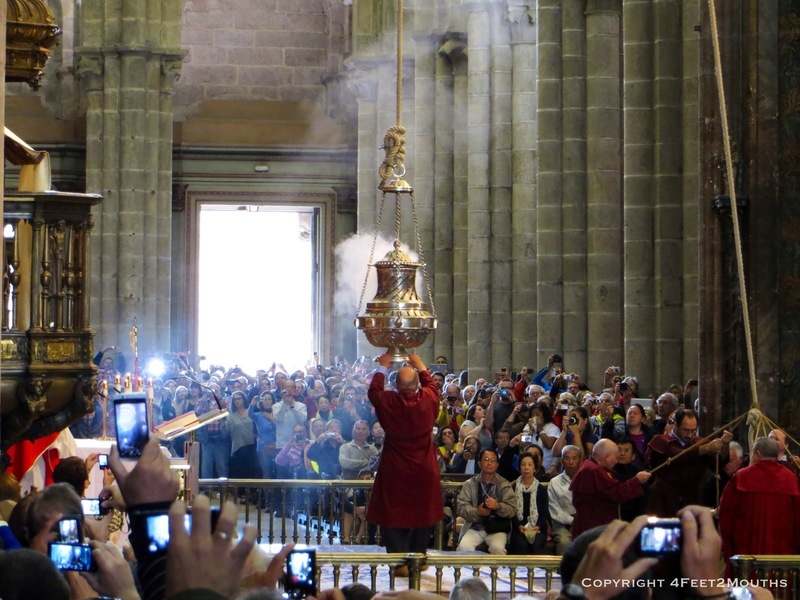 The next day we pushed on to Sarría where we encountered another of Galicia’s legacies – bus loads of pilgrims. 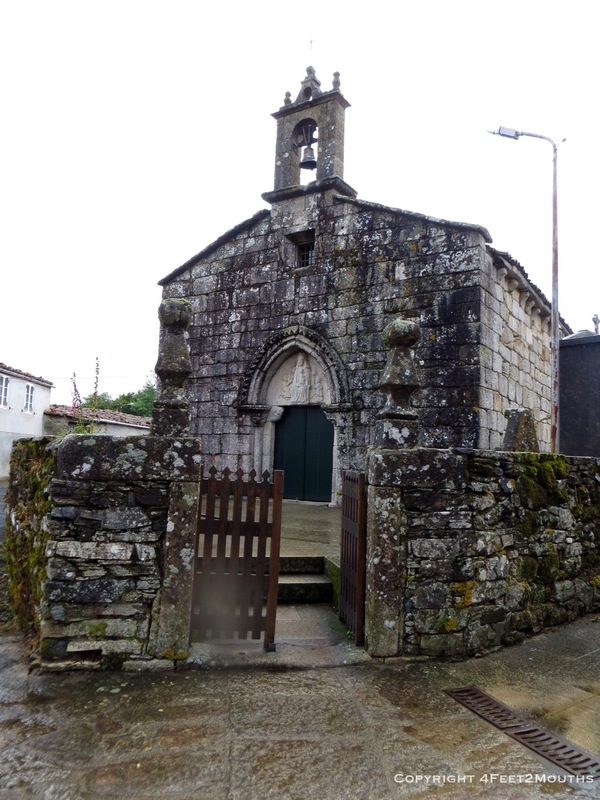 Sarría is about 100km to Santiago, the minimum required to receive the compostela. This means you receive official recognition from the church for your pilgrimage. The result is hundreds more people on the trail, most notably teenage youth groups that are very skilled at destroying the peace with their screaming and flirting and playing. We were just passing through Sarría but decided to stop for lunch at an italian restaurant called Matias. Sadly, I did not get a picture but I will always have the memory of how fulfilling the homemade tortellini was. And then there was the delicious tiramisu. I started to regret not including Italy on this round the world trip! There was no time to dwell on this thought as it was time to move on. The next day brought more, harder rain. I had had a dreadful nights sleep due to snorers and was greatly looking forward to a café con leche and a pasty in Portomarín. We ducked into the first cafe and we were served blah coffee. They don’t have pastries. Then a jackhammer starts up outside. After we leave I get stuck behind a gigantic youth group on the trail. It’s one of those days. 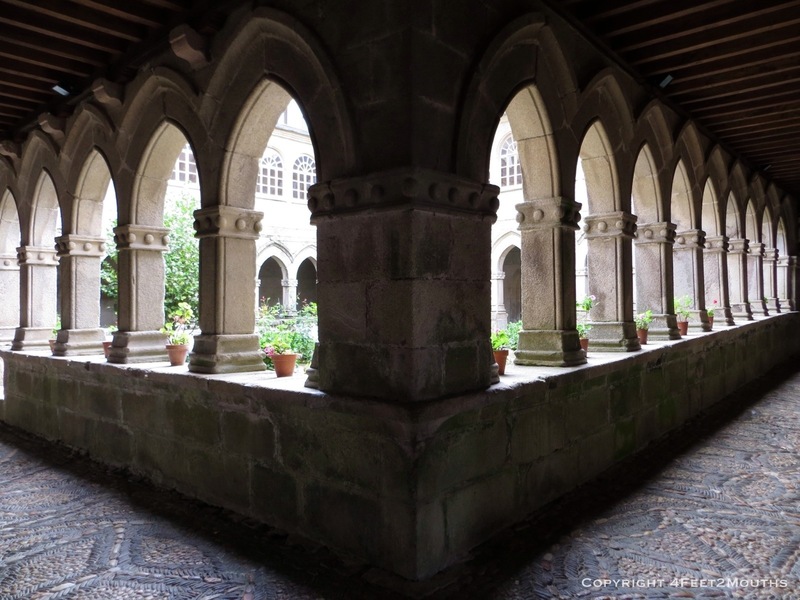 I began to feel frustrated that I couldn’t get my desires met – sleep, good drink and food, peace. 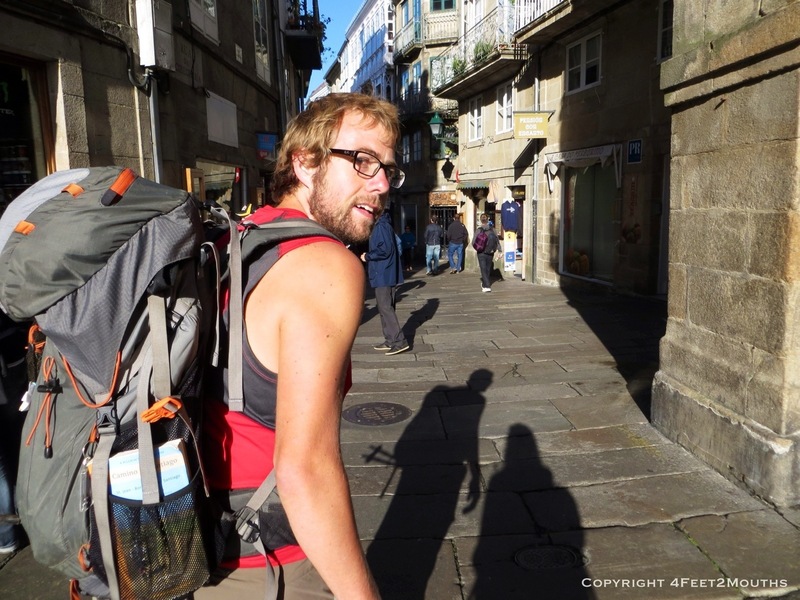 But part of the camino is learning to accept the bad with the good – even the teenagers. One day I will once again have more control over these things but in the meantime it is a trade off I make for the incredible experiences I am having this year. 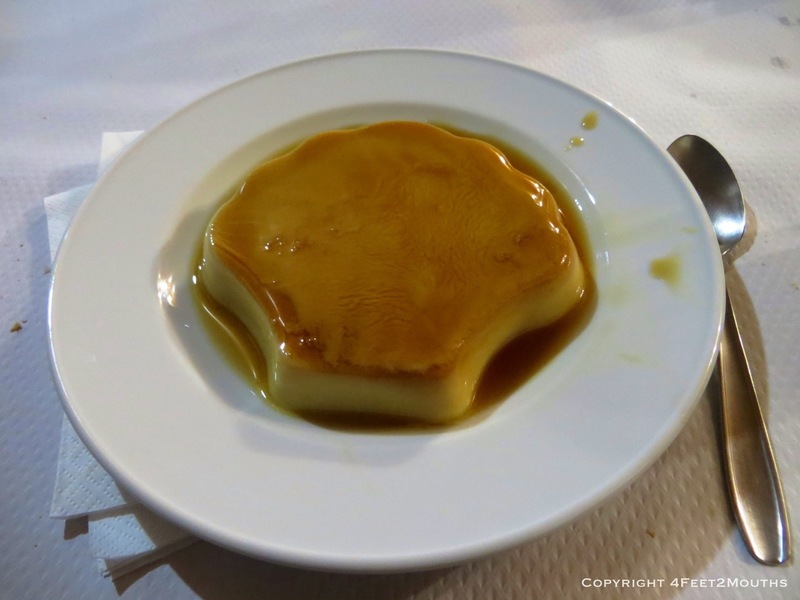 When we finally arrived in Palais do Rei the camino gods took pity on us. After being told by albergue after albergue that they were full, we picked up a cancellation at the last one we checked. The following dawn was a new day and I had a special treat to look forward to. 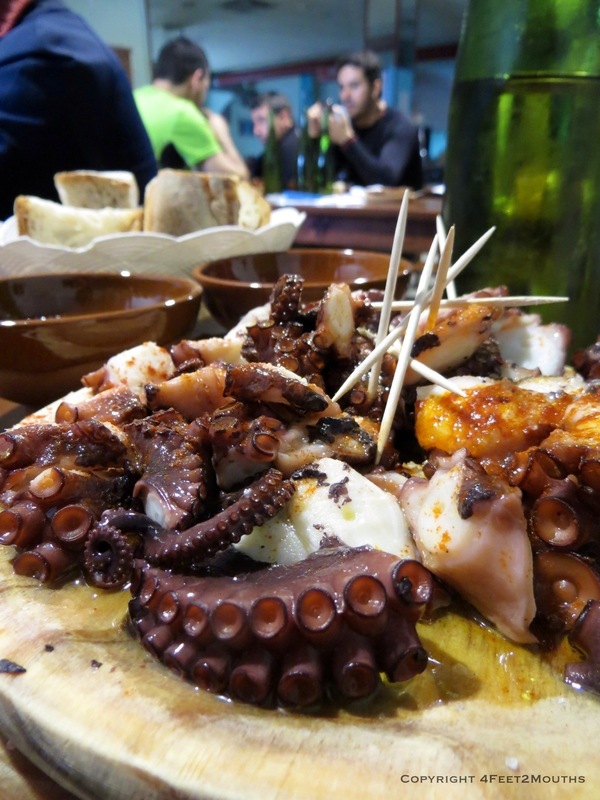 Around lunch time we entered into the town of Melide and we made a beeline for Pulpería Ezequiel, a restaurant specializing in octopus. We ordered a grill plate for two which arrived dripping with olive oil and paprika, accompanied by crusty bread. Our white wine was served in small rustic bowls instead of glasses. With the long communal tables and convivial atmosphere it was the Spanish equivalent of a German beer garden. I loved it. That night in Arzúa we again garnered one of the last beds in town, this time in a rather dank basement. In the middle of the night we were awoken by strange screams. It sounded like a scene from the exorcist. But when someone with a flashlight went to investigate the screaming stopped and it was a mystery as to who was making the noise. 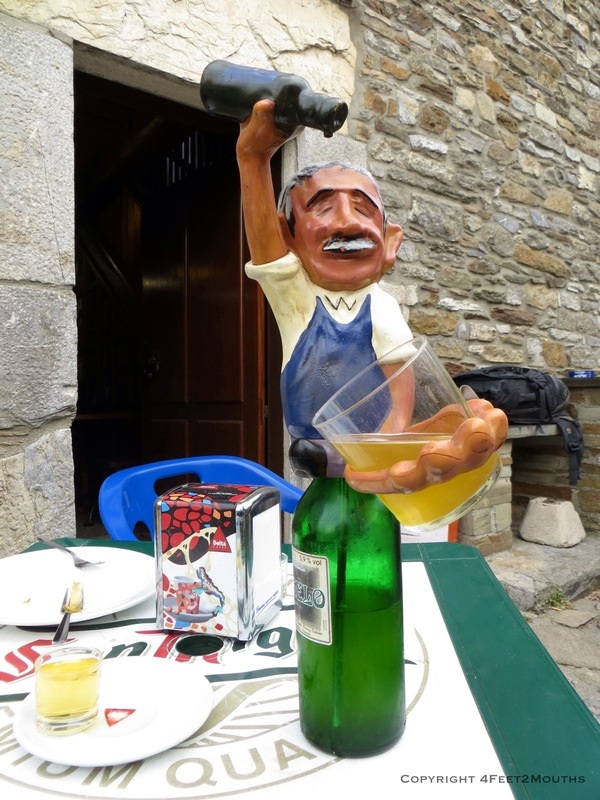 You never know what can happen on the camino. The eeriness continued in the morning as we left before sunrise in a extremely thick fog. 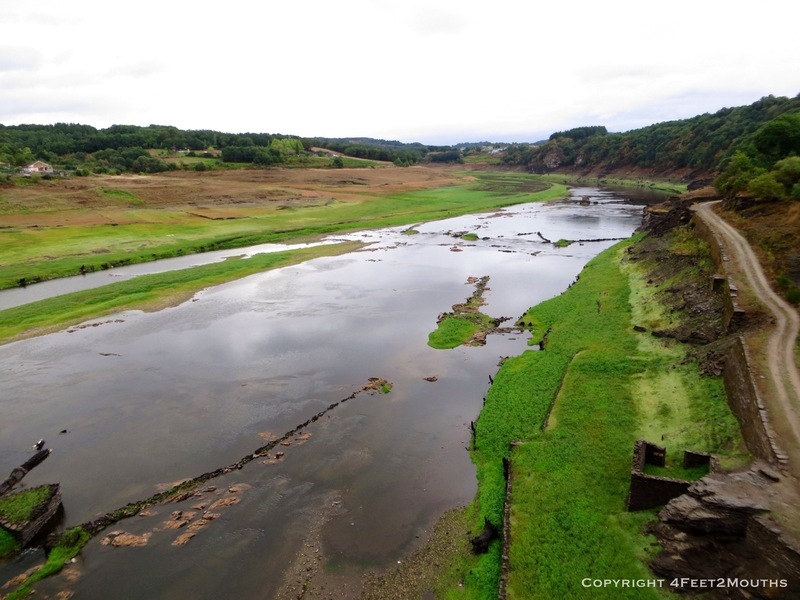 But as the clouds cleared we had a choice – to make a big 40km push to Santiago or take it slow with two 20km days. We decided on the latter. After so many kilometers why not draw it out a bit? We settled into a nice hostel in the tiny town of Arca o Pino. And then it was the final day. We took it slow and stopped for coffee and cake. Somehow, we managed to avoid all the large groups and were able to have the trail largely to ourselves. We took time to reflect on our journey and all its highlights. 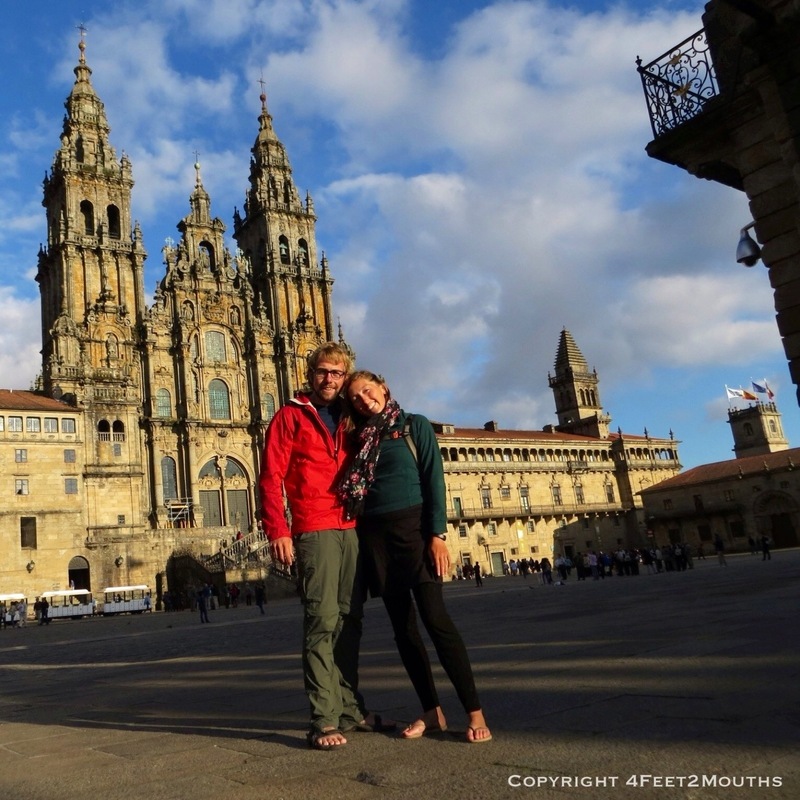 Nathan and I felt that if we could finish the camino together, we could make it through anything. And we did! 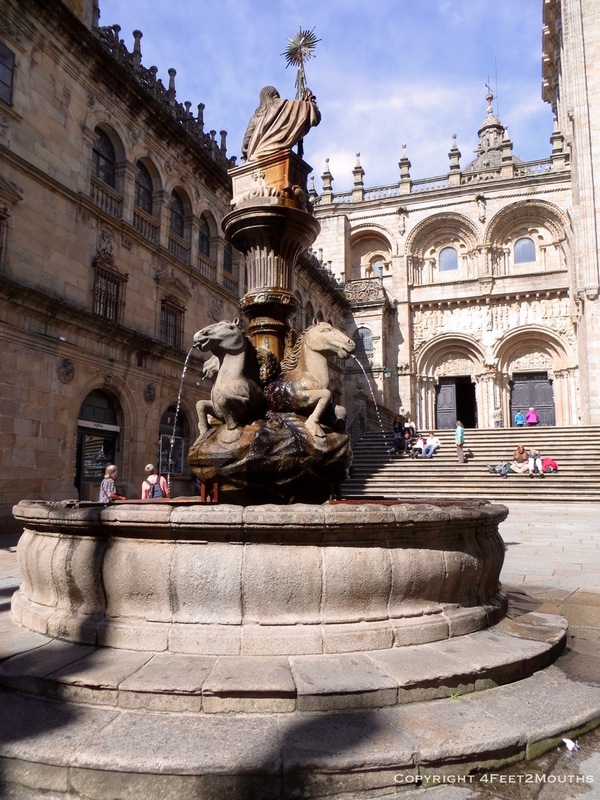 Walking up to the cathedral in Santiago de Compostela did not provide any great epiphanies for me. I did not even sigh with relief. 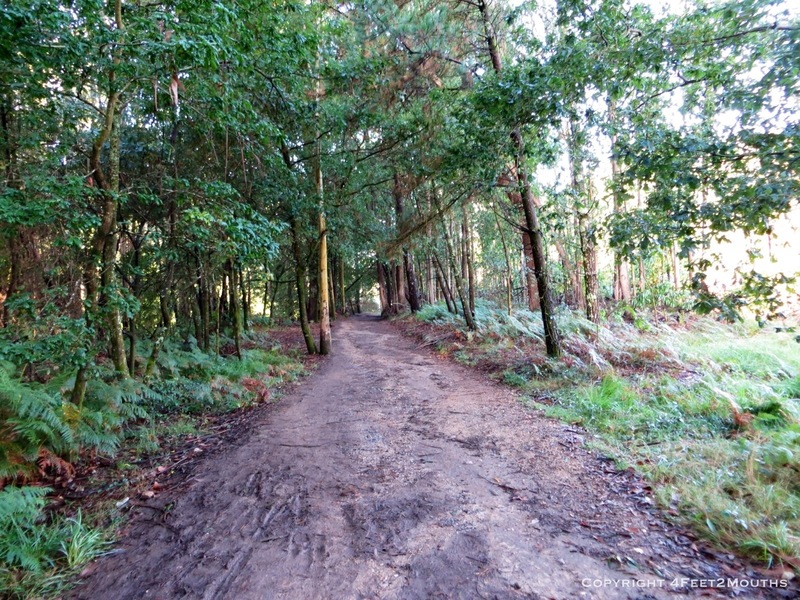 I simply felt grateful (again) that I had such a wonderful walk and that I had the physical ability to do it. To have met the people I did. To have the courage to fulfill my dream of taking this year off to explore the world. To be alive. I know how lucky I am. 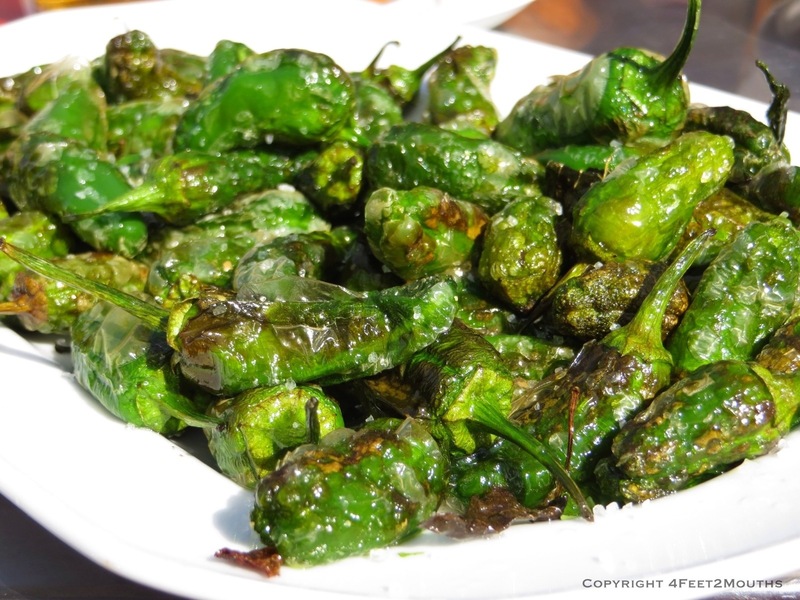 Our celebratory lunch was outside on a plaza where Nathan spied one of his favorite tapas, pimientos de padrón. In the afternoon we simply walked around the town saying hello to people we recognized. We told everyone to meet in front of the cathedral for our last pilgrim dinner. A group of 14 of us gathered with plenty of hugs going around. It was a fitting end to a wonderful journey. Yay! Congrats on making it through this journey! So how may days total did it take? 29 days, we’re happy to be done too! Awesome read. So psyched for you guys. you guys can take a long walk and ring my bell anytime! Great, we were worried that Maisón Manish would be closing its doors.